﻿ Digital voltage regulator KONreg S1000 – KONČAR Elektronika i informatika d.d. All-in-one excitation system for brushless and small synchronous generators, motors and motor-generator sets. KONreg S1000 with its compact design, small dimensions and integrated power converter is ideal solution for brushless and small synchronous generators, motors and motor-generator sets. KONreg S1000 supports a number of communication protocols and in itself has built several communication interfaces. This kind of design in conjunction with software allows regulation up to 25A (40A, 10s) and 375BVdc. The main control loop is an automatic voltage regulator with adjustable PID controller. In addition to that in regulator are implemented other additional control functions such as power factor controller or cos (φ) regulator. Field current regulator of PI type is built in as a stand-by regulator. Synchronization function is also implemented in regulator. System allows easy adjustment of all parameters, supervision of all signals inside system and waveform capture (record) through a personal computer and the HMI device. Platform for digital control is very adjustable and has a number of sub-systems responsible for optimizing energy production and maintenance of the generator in safe mode. The ideal solution for brushless synchronous generators and motors. By changing the application program in addition to voltage regulation it is possible to control the motor-generator set. As an integrated solution KONreg S1000 is intended for voltage regulation. 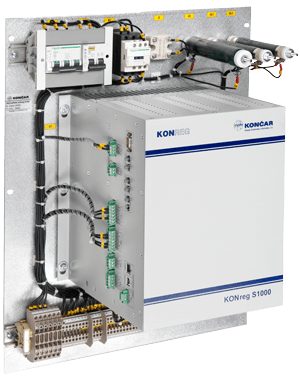 The combination of advanced digital control platform, IGBT technology and the associated application program, KONreg S1000 enables excitation control, generator control sequence, the protection of power equipment, communication and signaling to remote devices and systems in which it is integrated.